This "Historically Speaking" column appeared in the Exeter News-Letter on Friday, April 28, 2017. By the mid-19th century, the town of Exeter needed some sprucing up. The previous two centuries had seen the town expand to just over 3,000 people. All this civilization had taken a toll on the landscape. New Englanders are practical people. Roads tended to be serviceable, but the areas around intersections tended to look untidy and downright unattractive. By the 1840s, the town was also missing something – trees. For a place that had made its fortune in the lumber business, there was little evidence of it. In 1852, a group of Exeter men came together to form the Rockingham Agricultural Society – the first of many organizations created to improve the town’s appearance. One of the movers and shakers of the beautification movement was Judge Henry Flagg French. Charles Bell wrote of him, “He was also a man of marked public spirit. 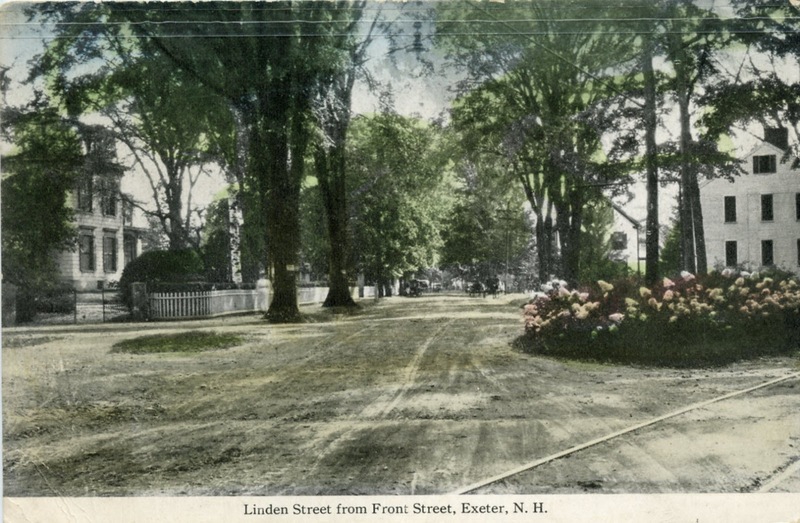 In Exeter he was interested in the streets and sidewalks and school-houses, in the laying out of the new cemetery, in the planting of shade trees, and in all that pertained to the improvement and beautifying of the place.” As a founding member of the Rockingham Agricultural Society, it was through his encouragement that Exeter planted its towering elm trees in the 1850s. Although he left Exeter in 1860, after his tenure on the court ended, French was still fondly remembered at the time of his death in 1885. “Our town is mainly indebted to his exertions for many of the fine shade trees which ornament the town. Of the trees French planted, there are none left. The elm trees of Exeter came down catastrophically during hurricanes in 1938 and 1954." Any elm trees that remained succumbed to Dutch elm disease in the 1960s and 70s. For nearly 100 years, however, Exeter was known for its lovely elm trees. In 1866, another organization, the Exeter Agricultural and Horticultural Society was born. Focused primarily on its annual exhibition, the group encouraged the production not only of produce, but flowers. The winner of the ‘Best Exhibition of Flowers’ received a copy of Edward Sprague Rand’s Garden Flowers and How to Raise Them, although Exeter Historical Society volunteer Pam Gjettum drily remarked, when hearing of this, that perhaps that book should have gone to the loser. It must have taken a bit of work to convince the town’s austere Puritans to grow something as frivolous as decorative flowers. By 1890, the Exeter Agricultural and Horticultural Society had reorganized itself and was now called the Exeter Agricultural, Industrial and Town Improvement Association, or as it was better known, the Exeter A.I. and T. I. Association. The mission of the association was broadened to include not just agriculture and horticulture, but improvement in other areas. “We will make it the especial object of our society to improve and protect the beauty and good condition of our streets and roads, walks and paths, trees, shrubs and plants and every form of scenic beauty in our town.” The ‘industrial’ part of the name refers to another goal: “we pledge ourselves to unite in any earnest endeavor to secure the best and most efficient water, light and power service for Exeter.” In addition, “we desire and will assist in the establishment of suitable Hospital service for all emergencies liable to arise in Exeter.” Beautification was encouraged, but technological progress was also needed to improve health and well-being. They chose as their president, John D. Lyman, who was also the head of Gilman Grange. Like the grange, the Exeter A.I. and T.I. Association had a very progressive agenda. “We believe if Exeter will cast aside her doubts and fears and allow herself to be possessed of the Spirit of Energy anxious to dominate, the near future will witness a marked increase of population, influence and fame,” encouraged the membership flyer. “Will you help make it all we hope? Then join the society. whether you be man, woman or child; whether you be rich or poor; whatever be your station, occupation, sect, or race; we ask you to help Old Exeter to the extent of TWO CENTS EACH WEEK. NO MORE.” The Exeter A.I. and T.I. Association was active in town until 1953. At the same time the Exeter A.I. and T. I. was active, another group organized in 1902 – The Town Improvement Association of Exeter, New Hampshire. The stated goal of this group was, “to promote neatness and order, and do whatever may tend to improve the town and beautify it as a place of residence.” The members set to work to clean up the town by placing wastepaper baskets around town, encouraging tidy landscaping and minimizing ugly outdoor advertising. Meeting minutes from 1906 indicate that the town was becoming filled with posters and broadsides. “Mr. Gooch be requested to enforce the law in regard to posting notices on trees,” and “Mrs. Burlingame was appointed a committee to investigate the painting of advertisements on rocks or boulders on our public highways and if possible to find some means of controlling the nuisance” wrote secretary Frances Moulton. Clean up days became an annual event in modern times. The work of the Conservation Commission in the 1970s continued the work of planting trees and cleaning up around the dam. More work is needed on the river now that the dam is gone, but with the help of other civic organizations, this is sure to become a priority. Our predecessors would be proud. Image: The intersection of Linden, Pine and Front Streets as it looked c. 1910. The work of various improvement groups has made this a ‘beauty spot’ with shade trees, flowers and no advertising posters on the fences.